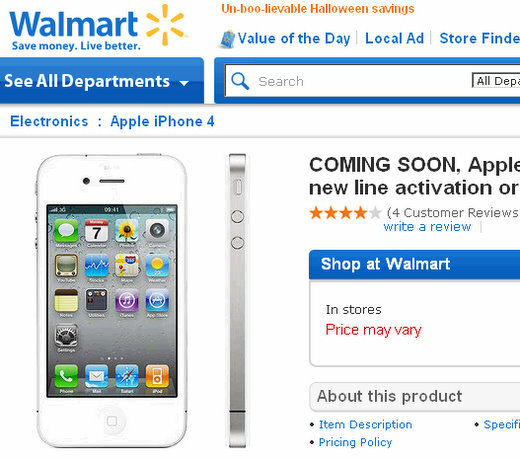 Have You Seen Wal Mart's White iPhone 4 Sales Page? Have You Seen Wal Mart’s White iPhone 4 Sales Page? I’m not quite sure how old this webpage is, but this is no doubt Wal Mart’s White iPhone 4 sales page. There are comments at the bottom that date back to July and August, if that’s any indication. However, the fact that Wal Mart is still promoting the white iPhone 4 would be a good reason to believe that is it coming soon. Wal Mart is not the type of company that would be wasting bandwidth with a dead-end page. So what do you think? Is Wal Mart preparing itself for the arrival of the white iPhone 4? Or is this just a page Wal Mart built in anticipation of the arrival of the white iPhone 4 back in the summer, but just left it up for when that time does come? After all, the white iPhone 4 was expected back in August, 2010.